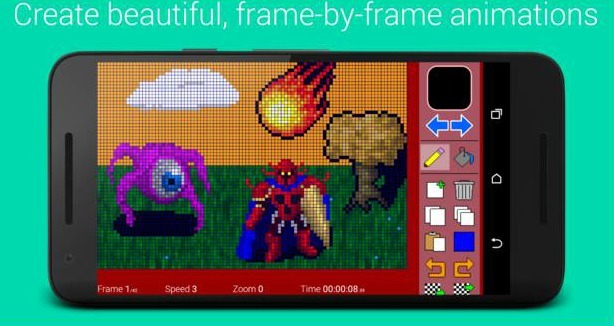 Do you want a devoted companion in your pocket that lets you make your own GIF and MP4 animations? Are you looking for a better and quicker way to do that? If you do, then the Pixel Animation Studio app is the perfect solution for you. Created by FairWare, this Android app is compatible with all of your devices and has smooth and intuitive user interface, allowing you a simple handling and usage. We loved this GIF and MP4 maker because it has dozens of awesome features. For example, you can draw your own animations and then upload them wherever you want to, like on YouTube, Facebook, Twitter, Instagram, Google+, etc. Make your creations with unlimited number of frames, pick and customize the frame sizes, customize your colors and set the speed for each frame. There are undo and redo option for your actions, copy, paste, insert and delete options for the frames, and many other amazing features and functions. You can even add music to your animations to make them more appealing, zoom while drawing and save your creations in a HD resolution. If you can’t manage the app, Pixel Animation Studio offers tutorials and 2 demo projects. Download it today - it is free on Google Play!